April has been rather a mixed month, starting very cold and, while I know it has been warm in the south of England, here in Scotland we have only had couple of dry sunny days with a high of 14C! 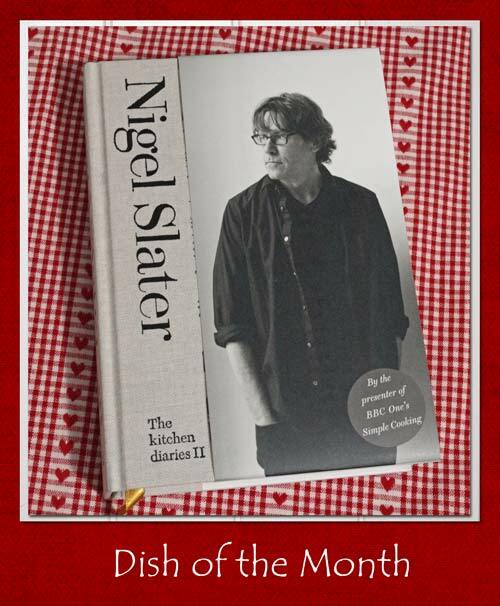 However, in April's Dish of the Month kitchens, there has been much activity and many delicious dishes. 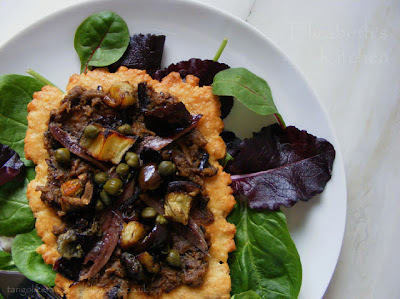 In Elizabeth's Kitchen Aubergine Tarts were on the menu and here is what Elizabeth says about them "The aubergine puree has a gorgeous flavour and texture and when combined with the anchovies, capers and cheese pastry - oh yes, mouth-wateringly nice indeed." 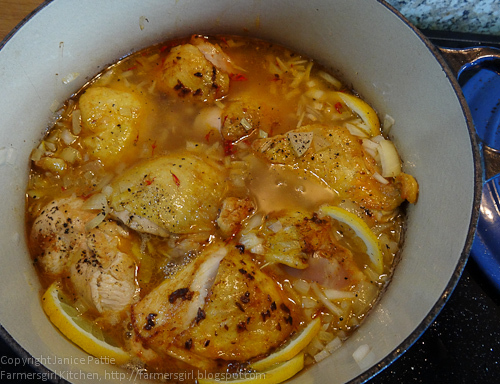 My own entry is Chicken with olives and lemon from the April chapter of the Kitchen Diaries II a very simple and delicious supper dish. My friend and co-host of Dish of the Month, Sue at A little bit of Heaven on a Plate made a stunning Parfait of Lemon and Orange. Sue made her own meringues and, because they were homemade, they were nice and mallowy in the centre and crunchy on the outside, adding to the overall loveliness of the finished parfait. Maggie at Kitchen Delights made 'a Soup of Cauliflower and Cheese', which is apparently a soup version of Welsh Rarebit, and it certainly does look good. The New Mrs P made Nigel's Savoury Apple Crumble which she felt didn't turn out quite as well as she had hoped, but thought that it had potential with a little more care! 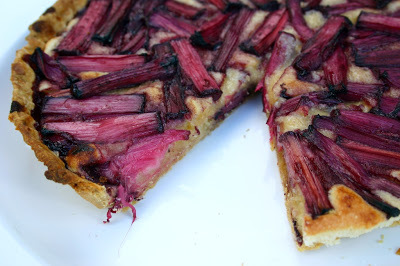 Dom, from Belleau Kitchen, baked a Red Wine Roasted Rhubarb Frangipane tart which inspired me to make a similar tart but I roasted my rhubarb with orange. 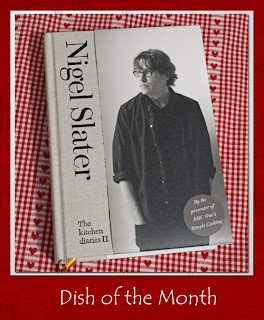 Foodie Quine had an unexpected Twitter interaction with our inspiration, Nigel Slater, who apparently doesn't like his eggs 'au naturel'. 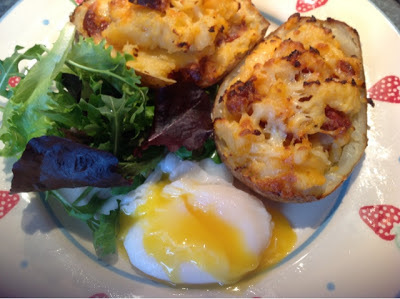 However, he seemed to have forgiven her as she did such a sterling job of making his recipe for Chorizo Potatoes! 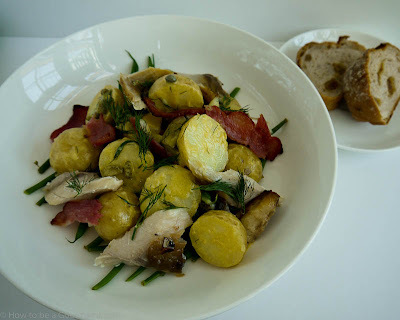 Our final dish is a Mackerel, Bacon and New Potato Salad from Nigel's Simple Cooking TV series which is shared with us by Jacqueline at How to be a Gourmand. Many thanks to all who took part this month. The May Dish of the Month will be hosted over at A Little Bit of Heaven on a Plate, although I will also be featuring the linky. I could go any one of those dishes right now - they all look and sound so lovely! Thanks Janice and to everyone who entered, fabulous! 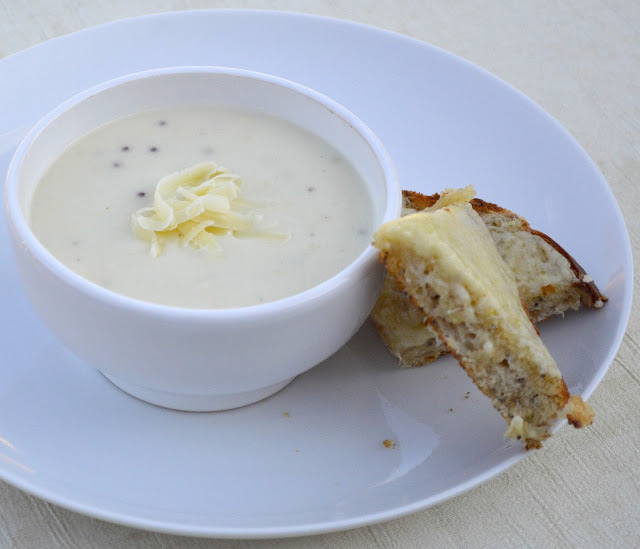 A beautiful collection of recipes Janice. Thanks to you and Susan for hosting such a fab challenge! Everything looks delicious, love the sound of the chicken best. Lovely round up. So I'm getting ideas now.